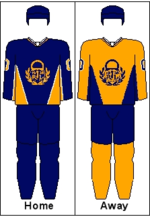 Lukko (Finnish for "lock") is a Finnish professional ice hockey team based in Rauma, Finland. They currently play in the Finnish Liiga, the top tier of Finnish ice hockey. The club was founded in 1936 as Rauma Woodin Lukko, and play their home games in the Äijänsuo Arena which has a capacity of 5,400 spectators. They have won the Finnish championship once, in 1963. Since 2011, Lukko has also had a team in the Women's Pesäpallo Championship League (Superpesis). ^ "Lukko Rauma". Eurohockey.com. Retrieved 3 November 2016. This article about sports in Finland is a stub. You can help Wikipedia by expanding it. This page was last edited on 19 February 2019, at 02:41 (UTC).